A 24-inch, true strain musky. Weather: Mostly cloudy. High in the low 80's. Wind 10 to 15 mph from the southeast. Rain after 3pm. Moon: Waxing. Just after the first quarter. Water Conditions: Warm, clear and weedy. Seeing that I'm only 33 years-old and most anglers go their entire lives without catching a musky, I'm in no way embarrassed at my limited experience with them. I've hooked 3 in open water while fishing for other fish, but landed none of them. The only times I've specifically targeted musky have been ice fishing and that was only this year. I caught a 30-inch tiger musky (hybrid of a musky and northern pike) through the ice in January and added a mini true strain musky a few weeks later. As far as targeting musky from a boat in open water, this was a first for me. It was also a first for Joe and the the last part of my Esox Hat-Trick. To my partial surprise, it was a success. Although the fish I'm holding above is a small specimen by musky standards, it's still a musky. There had been so much trouble catching a pickerel and a pike that I had a weird hunch catching a muskellunge was going to be easier. We fished hard for 9 hours, but I had my hat-trick completed after the first 90 minutes. 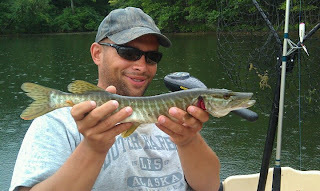 I'm no musky expert...yet, but I did have the gear to get the job done. I spooled my Shimano Calutta 400B with some leftover 50-pound Sufix braid and screwed it into a 7-foot St. Croix Premier casting rod. I bought steel leaders and brought along big topwaters and stickbaits that I have acquired over the years. After reading a recent article in The Fisherman, I wanted to get my "walk-the-dog" action down with a casting rod. This is a popular way to work surface baits and apparently produces a lot of musky. I'm used to working topwater baits like Zara Spooks on spinning rods and using the rod-tip to get the right action, but on casting rods, the motion is generated through quick half-turns of the reel handle. I picked it up pretty quick and kept at it. At about 9am, I was "walking-the-dog" with a Saltwater-sized Zara Spook over a submerged weedbed in 10-feet of water. I saw something smack it, and before I could tell Joe that it got hit, the fish nailed it again. It was an incredible topwater exposion and after a short fight, I landed my first open-water musky; a 24-inch true strain. We moved over to the other lake at 2pm, where Joe caught his very first musky, a 16-inch tiger that hit a Rapala Husky Jerk. I caught a chunky bass there and we saw bigger fish surfacing but they would not eat. The rain got to us after awhile and since 9 hours in a boat had my back aching pretty bad, we called it a day. A very, very successful day. I have to say, that in all the time I've been fishing, this is probably one of the coolest things that I have done. Catching pike and pickerel may not be the most challenging thing in the world, but to do it in New Jersey on consecutive days and then add the infamously difficult musky to the list is a pretty tall order. I got feedback from "highly unlikely" to "impossible" from a message board I frequent. I'm a little surprised it worked out, but I would have never even had a chance had I not put in the time on the water.